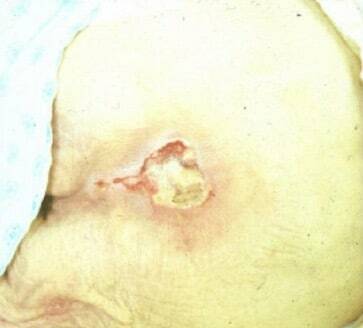 A Kennedy Terminal Ulcer or Kennedy ulcer is a specific type of bed sore (also referred to as pressure sore, pressure ulcer or decubitus ulcer) that is characterized by rapid onset and rapid tissue breakdown. The ‘Kennedy Ulcer’ was named after Karen Lou Kennedy-Evans- the nurse who discovered the medical condition. The treatment options for people with Kennedy ulcers are limited due rapid development and progression. Consequently, most treatment for Kennedy uclers is focused on providing pain relief.